coffee. Just a year or so ago it was virtually impossible to get good coffee out here. Now it's pretty easy but there's still a great niche market with a huge potential. The Chinese taste is slowly being weaned onto the caffeine punch and with 13 million people still to get the buzz, there's a lot of room in the market place. The word is tamen, so even if you'd never seen the word before, you'd have a chance of guessing what it means and could at least get the second half of the sound. Saying that, the word has ten different pen strokes but at least it can be broken down. I think I've got the 15 words given to me last week now but I shall find out tomorrow. Another photo from Friday evening. Most people had left by this point but it was a nice crowd. The beard is now in full bloom! Pan, one of the guys who was out with us over the weekend has a great way of describing the intonations which I still find difficult to master (Ranger's command - Woody Guthrie). He's very into his music and so explains the intonation by conducting as he says a phrase. I may look a little strange waving my arms about as I speak but I'd rather do that than leave my hairdressers with a tonsure! Because I don't have enough on my plate at the moment, I've just arranged an interview with an English language tutoring company. I hope to give a couple of hours a week tutoring which should fund my weekends. 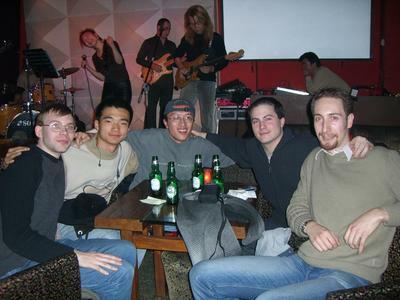 I really hadn't realised that going to bars was such an odd concept to a lot of Chinese people. Several of the Beijingers who came out with us on Friday night had never been to a bar and if they had, not more than a couple of times. I think some of them thought it a bit odd that the Westerners were all drinking beer while they sipped on their Chinese tea. A very friendly group but with a completely different idea of socialising. That said, we had a reasonable amount to talk about and will be seeing some of them again this coming weekend. It appears that not only am I shaking up the department but I'm corrupting the hardworking native Beijing population. Phill, you've taught me well! Sunday was spent mostly trying to find places which were warmer than my apartment. Builders came around early on Sunday morning to fix the holes in my door. They managed this but with the side effect that my door is now more window than door. I'm not too bothered as I'm not planning to laze around on my balcony any time soon. Incidentally, I've spoken before about the Chinese piracy problem. Within the universities there is an industry of copying textbooks. It's a difficult one though. The students simply can't afford the genuine books but I feel bad condoning the action. I guess the publishers need to set up deals with countries in which the students can't hope to own the original article otherwise. This has been done with at least one of the major academic publishers. At the moment a single small street here renowned for selling fake clothes is being sued for around half a billion dollars by the likes of Gucci, Prada, Ralph Lauren etc. I'm guessing they will fall into the blackhole of the Chinese legal system. Yesterday's lunch was an offally big surprise! A hotpot of untold depths of variety in both taste and texture. I am finding some things difficult to eat but I'm determined to get over what is clearly an artificial dislike of certain sensations. If a country of 1.3 billion can enjoy a bit of tripe as if it were a fine fillet of steak, I want a piece of the action. Today's lunch was a fine plate of this. It's pretty tough to get any poultry anywhere here at the moment and this is a pretty good alternative. Anyway, must get back to the Chinese studies. Well Grasshopper so you are thinking of opening a verion of centralperk in Beijing? (for the central aim of spreading jitters and late night conversation ). I like your toad though apparently licking is better than biting with some species. Your food intake is toadily astonishing. Don't you dare start reversing cultural norms and bring such delicacies as tripe to the bars and restaurants of the UK when you're back here! Toad? Ye gods shock. Eating your own shoes has gotta be better than that. Good to chat on Sunday. I think I have enough on my plate without attempting to start a cafe but for any business minded people, I'm sure that Beijing is a place full of trends that are only in their beginning stages. From what I understand, business out here can be pretty infuriating if you're used to Western practices but I'm sure anyone with enough business sense could make a killing out here. Alas, it's not toad, merely bullfrog. Toad I am yet to sample. I'm generally not averse to tripe. I wasn't too keen on the raw tripe I ate in a sushi bar but other than that, it's palatable when prepared well. It's fine, it was just a mild heart attack. That's what you get for trying to bring back 80s camp I'm afraid.